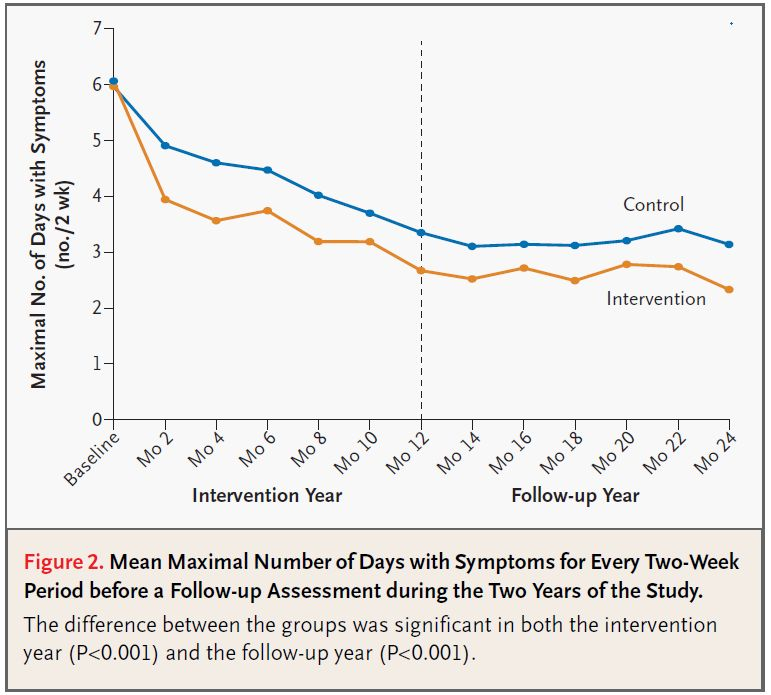 In a multifaceted, tailored, risk-directed intervention such as the National Cooperative Inner-City Asthma Study (NCICAS), it is impossible to discern the relative importance of the major asthma risks, and the effectiveness of the various intervention components, such as medication adherence, or environmental allergen reduction, etc. To pursue this issue in more detail the National Institute of Allergy and Infectious Diseases (NIAID) and the National Institutes of Environmental Health Sciences (NIEHS) established a second network of researchers to conduct studies aimed specially at the efficacy of environmental interventions. 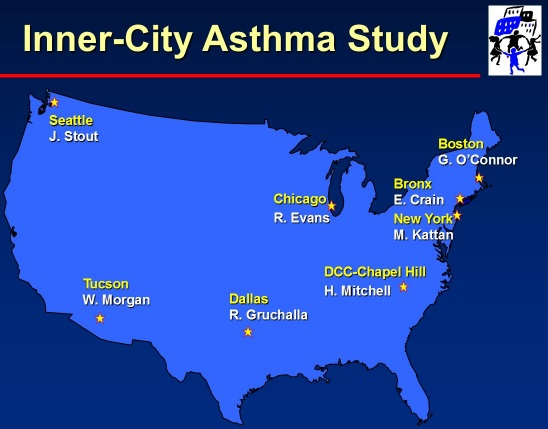 This study, named simply the Inner-City Asthma Study (ICAS), was initiated in part due to the compelling evidence regarding the pervasive environmental exposures and sensitivities among the NCICAS children. For example, cockroach allergen in inner city homes was quite common and high levels of cockroach sensitivity (more than 60%) observed in this population. Similarly, high rates of smoking (46%) were observed in the homes and many gas stoves without proper venting. ICAS was designed to address these, and many other environmental risks. Asthma Counselors were not employed for this intervention, but rather ICAS created specially trained Environmental Counselors, who assisted families in remediating exposures that were specifically problematic for their children with asthma. In a similar manner to the NCICAS CARAT, an Environmental Risk Assessment Tool was developed, called the ERAT. This assessment included an extensive home observation, dust collection for allergen levels, and caretaker report, combined with skin test sensitivities. This table shows the ERAT components with the source of the information (caretaker report or home evaluator observation). The ERAT questionnaire is thorough and provided here. As with the CARAT, the dust allergen exposures and sensitivities, along with the observational data, were linked to provide a tailored assessment for each family, which directed the activities of the Environmental Counselors and remediation efforts. This computerized report automatically combines the allergen sensitivity results from the skin tests, the questionnaire data, and dust allergen exposure findings to present the tailored intervention for each family and child. An example of the ERAT output report can be found here. The ICAS intervention was highly focused on the environment and did not include asthma counselors, nor physician involvement. Nonetheless, it led to a significant reduction in asthma morbidity, which also continued after the initial intervention year and proved to be cost effective. - Morgan WJ, Crain EF, Gruchalla RS, et al. O’Connor, G.T., Kattan, M., Evans, R., III, Stout, J.W., Malindzak, G., Smartt, E., Plaut, M., Walter, M., Vaughn, B. Mitchell, H. for the Inner-City Asthma Study Group. Results of a home-based environmental intervention among urban children with asthma, The New England Journal of Medicine, 2004, 351(11): 1068-80. - Kattan, M., Stearns, S.C. Crain, E.F., Stout, J.W., Gergen, P.J., Evans, R., Visness, C.M., Gruchalla, R.S., Morgan, W.J., O’Connor, G.T., Mastin, J.P., Mitchell, H.E. Cost-Effectiveness of a Home-Based Environmental Intervention for Inner-City Children with Asthma, Journal of Allergy and Clinical Immunology, 2005;116(5):1058-1063.